The US Postal System (USPS) currently subsidizes ChinaPost to please eBay: eBay collects fees, but we don't collect the postage. It is one of many burdens on the back of the USPS and its letter carriers which justify the Privatize Now! argument that says, "They'll never make money, so break it up and give my corporation the pieces!" 6a. leaves the USPS itself open to domestic political attack for being "unprofitable"
6c. forces Americans to subsidize eBay's profits with below-cost deliveries from China. Americans subsidize China's postal service with an inadequately compensated ride on our infrastructure. eBay collects revenue, we don't collect postage. Introduction - Slow motion murder of the postal system. Why is postage so complicated? The eBay Story eBay gives 1st Class service away to China, doesn't help Americans. Integrated Systems. International Negotiations -- but you had no seat at the table. What does it cost to send a package to China? How many pkgs come out of China for less than we pay for postage alone? Audit your ePacket settlement fees -- they ain't paying. Maintaining a simple postage page has treated me to a slow-motion murder movie. These people smile as they kill the postal system. They claim to be saving it as they look you in the eye, but their hands are busy elsewhere. Governance of our postal system, like our Congress itself, is dysfunctional. Corporations which compete with the United States Postal System have a large say in running it, and we don't -- we, the people, for whom the postal system was mandated by the Constitution and for whom it was created by our country's founding generations. At high levels of governance (the Postal Regulatory Commission, the Mailers Technical Advisory Committee, the USPS Board of Governors itself), power flows in ways familiar to us from Congress: through policy written by lobbyists rather than professional staff, through power derived from the influence of money to drive political appointments and policy, from not telling anyone what you are doing until it is done. At lower levels of governance, a revolving door injects corporate executives into the USPS, and rotates USPS executive out to commercial competitors. The revolving door protects policies that weaken, rather than strengthen, the postal system. Imagine you have worked almost long enough in government positions to pass through this revolving door to an industry job "retirement" at triple your government salary. In ten years you have duplicated your entire employment record, doubled your retirement wealth, it's a whole second life. This person can never rock the boat to defend the US Postal Service against the damaging moves and intentionally dysfunctional governance that played out in his office, on his watch. The slow-motion murder movies have a unifying theme -- the USPS is not profitable, governments cannot run anything for profit, therefore the USPS must be given to corporations to run, which means the USPS must be privatized. The fallacy is that the government is running the government. Ridiculous! Democratic government structures are not running the USPS. But it is a second fallacy that I deal with below: we do not need profitability in the first place. We must not insist on profitability in a service for the common good. I suggest you try to stick it out with me if you think your corporate story and your vision of corporate profit is so totally clear. Unless we can chart islands of refuge from capitalism, an angry electorate will turn against capitalism itself. There is no better way to mobilize private monies for investment in wealth creation than capitalism, lower "c", so stick it out with me while we try to tweak Capitalism, capital "C". After that, we review briefly the drive of dysfunctional governance for ever-increasing complexity. "We will save the system financially," they say, smiling as they look you in the eye, by making your service unusable and driving your business away. We come then to the eBay story. FREE SHIPPING, FREE RIDE, BUT WHO REALLY PAYS? The few fraudulent or defective eBay items I've received from China have not lessened my enthusiasm for eBay, but, as the person who has maintained tables here for nearly all of the retail postal services in the US system, I couldn't help but notice that the entire cost of many items I purchased through eBay from China was less than just the postage I needed to return them. I could not return anything to China for what China charged me for the entire item, postage included. Is the postage free if the package goes one way but not the other? Imagine a 4 oz "flat" (large envelope): if the mailman walks one way, the postage is $5.10, but if he turns around, it's free? Or the smallest box (under 8 oz) you can mail internationally that costs $13.75 to Zone 3, China. To recover what it costs to get it to China, the US Postal Service has determined that an American must pay $13.75, but coming out of China it costs nothing? The question of who pays for the Chinese invasion on eBay remained one of Life's Eternal Mysteries until one day, while doing the research needed to update these pages, a page from an Asian business journal (China Knowledge / Alibaba News) popped up on my screen. The page reported a not very well-publicized three-way negotiation seemingly led by eBay between the government postal services of China and of the United States. Everything flashed by in an instant: an impotent Congress, a government run largely by and for corporations, public monies magically disappearing and re-appearing in private pockets. 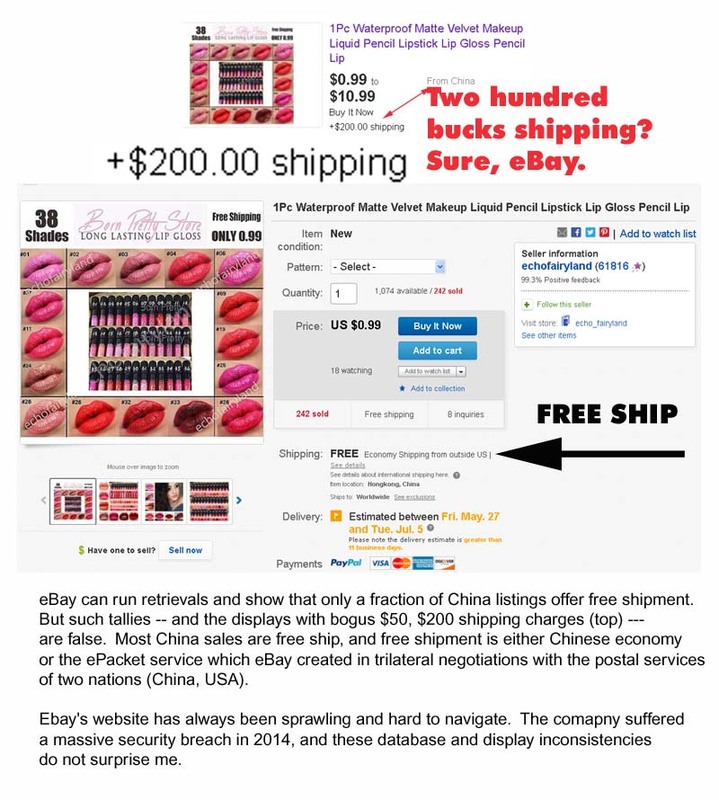 I understood why entire eBay-China items sold for less -- free shipping included -- than what Americans had to pay just for postage to China. Who pays for the Chinese invasion on eBay? We do. We gave China our First Class delivery system -- after enhancing it and integrating it with ChinaPost networks and data systems. This essay tells you the China story, but I was too discouraged at first to tackle it. I became too discouraged even to update the postage page itself, to make myself watch the relentless degradation of the country's postal system by men who could not see past themselves to any larger vision of greatness for their country. Some of you wrote to ask what was happening to the postage page, to offer encouragement. I thank each of you for that. I thank Robin for letting me take the time to research the Chines eBay export story enough to put some numbers on it. Now I hope the fun will return to updating rates on the postage page and teasing anyone who thinks this is the way to run a postal system. Here it is, see how much you like watching it, the vitality ebbing out of the system, the smiles as each deed is done. Years ago when it all started, I never dreamed that putting up a list of what stamps to put on an envelope could become so political, so poisonous. Let me say straight off a couple words about "privatization" and "profit", the words heard from anyone who wants to cut off a piece of the post office, take it home, and eat it. Americans are supposed to create a government that creates a postal system. That is what the plans laid out for creating the country itself say. The Founding Fathers wrote the existence of national "post roads" and a postal system into the Constitution. In the 1780s, a postal system was the surest way to give a major nation -- the first in 2000 years foolhardy enough to set itself up as a democracy -- the gift of an informed electorate. Today, to inform citizens about what governing elites are doing to them, we would also want an open internet, "net neutrality". Laugh with what has been attributed to Mark Twain ("If you don't read the newspaper you are uninformed, if you do read the newspaper you are misinformed. "), but keep the postal system and an open Internet. Most "savior attackers" of the USPS want the personal wealth that privatization of a large public operation will give them -- privatizing the postal system, the municipal water supply, the school system, our prisons, everyone's social security. Privatization created wealthy people in Russia, it will do the same thing here. I guess people like that think we want them. Such "privatization" is not the same as "profitability". "Profitable" is not a dirty word or a bad idea, as long as it is not dog-whistle code for "privatize into my pockets". Profitability is a proper tool for social engineering. Demanding profitability can jar a division or service our of complacency, even end corruption. Profitability can drive efficiency, even innovation. Profitability can be applied and then lifted again (e.g, to permit sinking a big investment into infrastructure upgrades), One applies profitability rules to keep this or that part of a large organization in top form. Perhaps profit fails at the post office because the governance of the United States' postal system already is corporate and they don't want profitability. Until they have a corpse, the privatization vultures must content themselves with hastening death. Every service change or service center closure that weakens the USPS feeds the central argument that the USPS must be placed in private hands to be run properly. Governments are not competent, the USPS cannot be saved until it is removed from government mismanagement and given to corporations. Corporations are competent to make money, and knowing how to make money is the same as knowing how to serve a country's people. Watching others grow rich is all anyone could ever wanted in this world. Let's not argue over who can drive the greatest profit, corporations or government. If we are running to optimize the country, the USPS does not have to be profitable in all that it does and corporations are not profitable all the time either. Corporations will run at a loss to cut out a competitor and capture a market. There are larger goals than profitability. HOW FAR DO YOU WANT TO GO WITH PROFITABILITY? All the way, nothing else in sight? Perhaps we both agree that the town Post Office in zipcode XYZ will not be profitable as far as we can currently project. You want to close it to end the dollar losses. I am willing to bleed money until we look at it again 20 years from now in our next official review period. 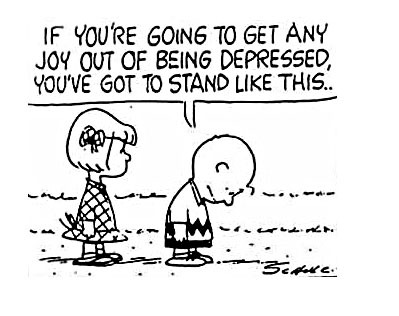 Why put up with a loss? Because closing that post office will close main street businesses in that town, damage those families, and guarantee that those parents' children and grandchildren leave town, settling down perhaps too far away to visit in old age. WHY SHOULD THE TOWN DIE? My story has many factors in a synthesized abstraction, but no single value measured in dollars. You have only one factor which is itself little more than a number of dollars. You feel precise, decisive, superior. Perhaps you are not good at "synthesized abstraction" (connecting the dots). I look at more things than you do. It's a complicated world out there, and my description is as valid as yours. A BIG COUNTRY CAN HAVE A BIG HEART. Try looking at the census. The Census Bureau says 80% of us are urbanized. At the Census Bureau, the "urban" definition is loose, and "rural" for them is pretty isolated, but isolation is exactly the point here. 80%-20%. So we have four Americans who won't hurt much if they come together to chip in and give one in five Americans a chance to stay on the land where their family has lived, perhaps for generations. If you and I know what we are doing, if anyone who wishes to do so can see what we are doing, then I don't care if today it goes your way or today it goes mine. If there is clarity and collegiality, the country will find its own way to a better future in the long run. Leaders gather armies to kill, but people usually help one another. If you cannot hide what you are doing from the people, it will be good in the long run. People who tell me we must close the post office to save money and we have no other choice but bankruptcy of the whole system are liars. Endless lies are a failure of leadership. If you can't tell the difference between a liar and a leader, then get out of public life, find something more suitable to do with yourself. For a lot of us who walk into one, a Post Office is part of our civic society -- it is in all our communities, it serves everyone, all of us in our daily lives, and it is not a corporation. Like many institutions of civic society in our time, the Post Office has been weakened. Destroy what we had in common and you'll find yourself bickering and fighting over whatever is left. This is the path to a once-great society lying in broken pieces on the ground. There is a choice between keeping our post office simple so that people can use it, and running it to squeeze out every dime. In the name of squeezing out more profit to save our postal service, USPS leadership has made the system more complex with every change discussed and approved. There is no change that does not add complexity, because there is no concern that, in the name of saving the system, those who now govern it have found a new tool to weaken it. USPS leadership is dysfunctional. RAPID RATE CHANGES. You tell me you must change rates rapidly because you want to save the system. If we are not making enough money, charge more for each stamp, that's the problem, there's the solution, how can anyone argue? Really? You didn't take Economics One in college? I can argue "elastic demand". Raise the cost and I'll go elsewhere, you're not the only and essential supplier. During the Great Depression of the Dirty Thirties, inflation did not change prices much, and postage rates did not change at all for 26 years. (In 1958, first class postage went up from three cents a letter to four.) After banks sold and resold enough fraudulent mortgages to crash the economy and the banking institutions themselves (2008, our own "Great Recession", too big to fail, etc. ), there was again little inflation to change prices. Yet 1st class letter postage rose the next year in 2009, and 3 years later in 2012, and in 2013 and in 2014, and then in 2016 it dropped. This instability is a sign of poor governance in the United States Postal Service (USPS). MORE ZONES WHERE RATES USED TO BE FLAT. You tell me you need more zones. Claiming again that you are trying to help, you become indignant: Do you expect us to carry your stuff more miles without charging more dollars?. Well, yes. In fact the country expects and legislated that you deliver a first class letter from anywhere to anywhere for the same cost for all of us, because that makes our great land feel like one country, that makes us feel more like we are all in this together, and such in-this-together feelings drive nations to greatness. A few zones are OK. After Canada and Mexico, you had two groups of countries (2 zones). That was fine -- I can display the two groups, and people will know which one is their group, their letter, their stamp. But when you went from international manila envelopes to little parcels, you broke those two groups into 7 zones for the parcels, and now we have to find a table of all the countries in the world, find a place to look for the zone number in which our country belongs, or else start looking online. Then: you could see at a glance how much postage you needed. Now: you can't. It's all international first class, and those small parcels weigh just the same as flats, but you had to separate all the zones (2,3,5,6,7,8,9 zones) for one, and leave them in two groups for the other. I ask why, you name a dollar cost figure, each zone has to pay its way. But how do costs change, zone by zone? The next zone is two dollars more, the one after that is 25 cents less. No one can figure it out, and half your customers leave. You've covered each box's cost exactly, and your traffic decreased. Are you missing something? Have you been on this job too long? What belongs to all of us is getting degraded -- year by year, revision by revision, by those who tell us not to help anyone in life who cannot pay for it. Let's stay with package shipping. THE INTERNET DRIVES MESSAGING DOWN. Despite changes in rates, changes in zoning, and changes occurring more frequently than ever before, USPS online sites have not made a change that would enable their retail customers to get a parcel post package ready to ship online. We Americans ("retail customers" in USPS terms) cannot print a shipping label for our box. Or a shipping label for a "small parcel, 1st class". This matters. In the ten years from 2006-2015 inclusive, almost everything about the postal service declined: first class mail volumes (about 36%), even the number of post offices. The USPS closed 977 post offices -- their own post offices, not just their desk in somebody else's building--apparently providing real estate opportunities for Dianne Feinstein's husband. But one thing went up: the volume of packages shipped. Shipping volumes went up 36% in the same ten years that first class volumes went down 36%. So yes, doom-sayers tell us the Post Office is a dinosaur because Internet email and messaging will never let First Class mail return to previous levels. Therefore, therefore (here comes the jump--it is not logic, but stay with us) therefore privatize the doomed US Postal Service--give up, tear it limb from limb, sell the pieces, let the vultures have the pieces they want, put employees on contract with nothing in the benefits package, let your children can read about unions in the history books. That's the way to do the nation's mail delivery. THE INTERNET DRIVES PACKAGE VOLUMES UP. But wait. Post Office traffic is surging as Internet e-commerce drives package delivery volumes to places it has never been before. Americans buy billions in shipping on line from the United Parcel Service corporation, while policy wonks keep the lid on at the post office. They help us understand our complex world by explaining over and over how the Internet is killing 1st class letters, while hoping we never notice that, back at the post office, the Internet has already driven package volumes up as much as letter volumes went down. And, overall, revenues collected on-line at the USPS for things other than pre-paid package shipping labels (for "1st Class Small Parcel and Retail Ground) have doubled over that same time period. Postal system leadership -- all of it, within the Postal Regulatory Commission, the Mailers Technical Advisory Committee where Pitney Bowes, FedEx, UPS, DHL, and Amazon tell the post office what the American people need, the USPS Board of Governors, or among USPS staff itself -- the leadership is incapable creating a system able to drive up retail usage through simplicity of service. If you don't agree, then get off this Website and write a simpler one yourself. The USPS needs to print parcel post shipping labels online and capture the rise in Internet-driven shipping revenues, no matter how much it might embarrass smart thank tanks like the Cato Institute or Brookings to watch the government compete successfully against private corporations like FedEx, UPS, DHL and Amazon. But the USPS already prints parcel post shipping labels online, doesn't it? Yes, you are correct. eBay users will find that their corporation has persuaded the USPS to let their customers do something that eBay was not able to arrange for all Americans to do. Corporate customers but not US citizens can use the United States Postal Service to buy parcel post shipping labels on line, and then ship boxes. National security and the war on terrorism make it imperative that we protect Americans from Americans who might ship nasty things hidden in their boxes, and never tell us. Compared to letting Americans mail their own boxes with lord knows what inside them, eBay knows what their customers have inside their boxes. eBay knows because the Chinese tell them. And no one lies or games eBay's systems -- I suppose the fraud I have experienced at eBay was unusual, just one bad apple in the bunch. eBay is perfect now. We're fine with corporate customers buying USPS services online, but let's stay safe with non-corporate citizens taking each package to a local post office, and asking a clerk to tell them everything is OK before they mail it. We will keep the US Postal Service out of the parcel business to keep you safe. Remember bombs, anthrax, terrorism -- let the corporations do it. Individual Chinese (individual sellers on eBay) can print shipping labels we can't, at first-class postage rates Americans do not have. INTEGRATED COMPUTER SYSTEMS AND DATA INTERCHANGE. It appears eBay drove tri-lateral negotiations between the postal systems of China and the United States. Agreement was announced in June 2010 to integrate computer networks, make data bases compatible, standardize bar codes, label layouts and Electronic Data interchange (EDI) formats, and provide real-time analytics to support logistical (trucking, air freight) operations. Press coverage at the time (2Jun2010) described the move as tri-lateral -- the first nation, the second nation, and a global corporation. The coverage said, "U.S. online marketplace eBay Inc recently entered into an international tri-lateral agreement with China Post, the country's official postal service, and the United States Postal Service." CORPORATION PRESENT AT INTERNATIONAL TREATY NEGOTIATIONS, BUT CITIZENS ABSENT. eBay officials attended the announcement ceremony because eBay was the party that drove the agreement. Present at the ceremony celebrating the joining of the two nation's systems was Jeff Liao, then CEO for eBay Greater China (eBay GC), Southeast Asia and Japan, as well as head of eBay's Asia-Pacific cross-border trade. The USPS was represented by Paul Vogel, president and chief marketing and sales officer at USPS, and Pranab M. Shah, Vice President and Managing Director, Global Business in the USPS's Office of the Inspector General. Not present was you. eBay's Jeff Liao said, "The collaboration will make the most of the advantages of the three while helping expand eBay's profits." Small parcels (up to 2kg, 4.4lbs) coming to the US would now enter the First Class delivery system, with enhanced scanning, tracking and delivery confirmation services. Americans pay $5.10 each (flat envelope under 4 oz) or $13.75 for a small box under 8 oz going to China, so those are presumably the costs that must be recovered when the Chinese shoot the same mail stream at us. If the USPS gets it wrong, then government Departments and organizations have independent "Inspector General" offices to audit them and fix system failures, errors, and fraud. The "IG" is the watchdog. Because Pranab M. Shah, a VP-level official of the USPS's Office of the Inspector General was present to celebrate the negotiations setting up small parcel delivery for eBay and ChinaPost, we can be sure that no fraud, systemic rate errors, or structural secrecies were built into the system . . .or, on the other hand, if they were, we can be sure that it will be a very, very long time before they become public and correctable. The USPS always says they gave services to Hong Kong, but Chinese don't have to go to Hong Kong to mail anything. Any CHINA POST post office in the country will do. Ebay wanted to open up all of China, and that is what the USPS has done, even if they can't bear to hear themselves say it. In the 2010 agreement, Ebay and the USPS catered to individual Chinese customers and individual eBay users. The USPS said, "The mission ... is to open up anew online silk road for ... individual users and help more Chinese users reaching out to the world" [emphasis added]. Just as press releases speaking only of Hongkong do not hide the fact that the Ebay negotiated USPS service for all of China, so later press releases speaking only of Hongkong merchants do not hide the fact that Ebay and the USPS were serving individual users in China. Ebay and the USPS were setting rates for "Retail Service", a service with no special applications to qualify for Commercial Rates, a service with no weight or volume minimums. Retail Service in the United States is what a US citizens would pay if he walked into any Post Office. Those are the $5.10 and $13.75 costs I cite just for transport, not anything inside. The new ePackets coming out of China got first-class service across the United States with a new label and barcode design, scanning, tracking, and Delivery Confirmation service, right to your kitchen door, beginning in April 2011. ON-LINE SERVICE DISAPPEARS FOR AMERICANS. I don't know when trilateral negotiations began, but their completion was announced in June of 2010. After information technology contractors had completed the integration of US and Chinese data networks, first class ePacket service from China was announced the following year, in April of 2011. As a guy maintaining this little postage chart site, it had always puzzled me that 2011 was the year when, for no reason that I could see, the USPS stopped allowing Americans to buy First Class Small Package mailing labels online. We couldn't ship anything electronically. The timing never made sense. Why make a change out of the blue all by itself and not wait as usual for the next cycle when all changes to the service structure are printed up and publicized? The last rate change had been years earlier on 11May2009 and there was no rate change at all that year, none until 22Jan2012, so why take away on-line service now? Not only did the timing make no sense, but the move itself made no sense either, because shipping volumes were rising with e-commerce and the USPS needed to enter that revenue stream, not be advised to leave it. A NICE PERK FOR EBAY PEOPLE. Someone using my rate page noted that eBay customers buy the 1st Class Small Pkg mailing labels on a site controlled by eBay, and told me how to direct users here to go around the USPS ban and buy shipping labels there themselves. The cancellation of the ability of anyone to buy USPS shipping for a small package online except eBay customers struck a competitive blow against users in competing Internet auction companies (e.g. bonanza.com) -- other sellers wanting Small Package 1st Class service were faced with a trip to the Post Office. Ebay had a nice perk for its own customers -- at the cost of a policy that damaged the postal system that serves the nation as a whole. FREE DELIVERY CONFIRMATION DISAPPEARS FOR AMERICANS. When ePacket service was turned on for China (USPS announcement April 2011), online purchase of postage for 1st Class Small Packages was turned off for Americans. Since you now had to go to a Post Office to buy the postage, you became a "Retail Rate customer" and free tracking was turned off as well. America had tracking, but you had to pay for it -- $0.90 for tracking as of 2013Jan27, and raised to $1.05 in the rate table for 26Jan2014 shown above. As of April 2011, any First Class package automatically got tracking and delivery confirmation across in the United States, provided the package was dropped into the mail in China. The USPS could say, "But there's still free First Class Parcel tracking!" Answer: True, only nobody can qualify. The USPS could say, "You can't expect us to give you counter service for nothing. If you need help mailing your parcel, we're happy to provide it, but that costs money and you can't have free tracking too." Answer: I'd be happy to save you money by making online shipping purchases. Why did your turn the service off? The tracking restrictions on Americans were lifted by 10April2016, but there's money in buying shipping online, and the USPS still (rate table 2016Apr10) does not let Americans buy parcel shipping online. If those who govern the USPS and rotate in and out of private competitor corporations want to weaken their country's postal system, they ought to block this rising source of online revenues as long as possible. And they have. This is the rate table for 1st Class International Package service out of the USA. The rates to China are highlighted. Americans can't send a box to China for less than $13.75. (Eight ounces; details in the 1st Class Int'l Packages section). What if it is not a box, what if the item can masquerade as a document envelope, a "flat" with less than 1/4 thickness variation? Good. Four ounces, a quarter-pound, going to China as a "flat" is only $5.10, details in the Int'l Flats - "1st Class Mail international" section. What does it cost? Answer: $13.75, or $5.10 if its flat. First I want to give a shout-out to eBay China seller Thamesmall ("Thames Mall"). When I wrote that two items arrived and one didn't work properly, Thamesmall promptly mailed a replacement, no questions asked, and it worked. Hey Thames, thank you, that's the way to do it. But my good luck is not eBay's standard return procedure. Check it out: eBay records the item location as Shenzhen, China. eBay sets return policies offered to sellers, and one return policy that sellers can check off is "buyer pays return shipping", which than automatically generates the screen you see. No item selling for $5 or less can be returned, except at a total loss, because Americans do not have access to the rates eBay helped to negotiate for China. If an American can make the item look like a manila envelope weighing under 4 ounces, s/he can get it back to China for $5.10. No doubt eBay has other protections for American buyers of bad items, but the standard policy illustrated on this screen is a farce. The item costs less than its return postage. Let me be clear about this: eBay created a "buyer pays return shipping" policy, eBay implemented screens for sellers to choose this policy, lots of programmers wrote the code, the software runs on lots of servers, and eBay implemented the generation and display of listing screens for buyers that display this policy (one is illustrated above), and eBay engaged in trilateral negotiations with the two national postal entities involved (ChinaPost and the USPS) that make this policy a laughable farce. I am one customer who does not appreciate being treated this way. eBay herds customers. This is pathetic. I am not saying eBay doesn't have other buyer protection programs that work. I am just saying that this behavior is pathetic. But is this really a problem? What would anyone buy on the other side of the Pacific Ocean for such small amounts of money? THE eBAY TRAFFIC from CHINA: HOW MANY ITEMS FOR LESS THAN WE PAY FOR POSTAGE ALONE? Until eBay suppresses this information, a search will show that the number of items listed from China for less than five dollars fluctuates at any moment between two and three million (May 2016). There is no way any of them can be mailed back for less than the cost of the item. What if you need a box? Five dollars is an envelope price; USA postage for a box is $13.75 (10Apr2016 rates). Here is a snapshot of the number of listings at the cheapest price levels one evening in May. for less than the item's entire cost. You might enjoy a look at some individual items. Within a single supplier's list, the variety can be stunning -- consumer goods and the industrial tooling used to make them -- all in one eBay "store". Cheap stuff? Sell to America. Product done, closing the production line? Sell left-over production line to America. Americans can't put anything into the postal system for less than 34¢ or 47¢ (domestic postcard, or USA-only letter, 2016). How low does it go for China? Looking for something cheap from China? The number of listings for a dollar or less fluctuate between 200,000 and 300,000 (a Sunday morning in May, 2016). Here's a snapshot of the number of listings on eBay from China at the bottom of the price scale. For nearly all (93%) one-dollar-buys-it-all items from China, eBay obtains no funds to reimburse the United States for delivery. The more numerous -- and more savvy -- 99¢ crowd knows better and asks more often for more money, so 90% of these 99-cent items (not 93%) are free ship. Remember: total revenue is 99 cents for about 90% of these items. Do they pay us five or thirteen dollars for delivery on our nation-wide infrastructure? 77¢ items are nearly all $1Canadian items selling for $0.77US. 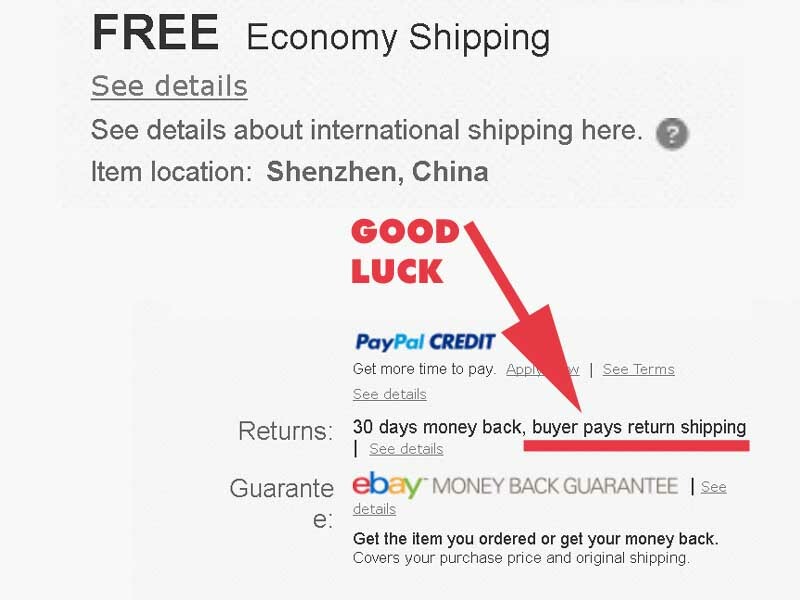 When eBay computers let a seller select shipping to United States but price in Canadian dollars, PayPal has an opportunity to profit on the currency conversion. Ebay can say, Whoa, we sure do collect shipping dollars from our sellers. Here is one listing behind their tally of collected shipping dollars which eBay can produce. I enjoy buying inexpensive items from China, and I thank eBay for simplifying the transportation, but who's paying for it? A Chinese seller -- via ChinaPost -- can pay our postal system only pennies for postage if her free shipment item sold for under a dollar. The United States Postal Service gets paid amounts that are trivial per item, and insulting compared to what Americans are forced to pay. American retail mailers lined up at post office counters in every American town are subsidizing China. But these are listing numbers -- how much actually got sold and shipped? Ebay will report for-sale listings from China. Here is a snapshot of the number of listings at cost levels of $13.70 or less. $13.75 is the least Americans can pay to send a box to China (weight up to 8 oz). Five million items are listed for sale below this price. You might enjoy a look at some individual items -- as we mentioned, consumer goods and the industrial tooling used to make them are all in one eBay "store". Free shipping, price included, is dominant at all price levels (see "Under a Dollar and Free Shipment Too", previous Section). Shipment by the eBay-negotiated ePacket service is the dominant shipping choice, except at the four or five lowest-price levels in the table above, where the Chinese people have and choose a still-cheaper China Post standard service. An American standing in his own Post Office, box in hand, has zero service below $13.75, but the Chinese have two. Obviously if Chinese on eBay are selling over a million items annually at under a dollar each (below), including the postage, then the postage paid is pennies . . . not $5.10 (flats from USA), not $13.75 (smallest box from USA, 2016). The USPS is losing money and has to cover its costs. If the cost recovery needed to sustain the mail stream into China must be $5.10 (if it is under 4oz and flat) or must be $13.75 (if it is under 8 oz and a box), then we better hope none of the 4+ million items listed above ever sell and come out of China, because they will never generate enough revenue into the American postal system to cover their cost. If $5.10 (under 4oz and flat) or $13.75 (under 8oz and a box) are not the cost that needs to be covered, why are we paying it? Maybe the postage Chinese people actually pay is indeed only pennies across the Pacific Ocean. Maybe the Chinese government subsidizes its postal system for its own people, and we do not do that for our people, so they pay pennies and we pay dollars. But if they get tracking and delivery confirmation across the USA, then Americans get tracking and delivery confirmation across the USA, right? If we have to pay $5.10 (envelope, 4oz) or $13.75 (small box, 8 oz; April2016), then those are the subsidies that the Chinese government must pay into our postal system. Just because my mail carrier turns around and walks the other way does not mean that all costs disappear. So, if those are the costs, and the Chinese government wants to subsidize individual Chinese sellers and entrepreneurs, good, do it, subsidize your own people to foster individual wealth creation. The size of that subsidy for the Chinese government to pay into the United States Postal System for carriage of all the stuff they want to sell and deliver here is $5.10 for a flat packet 4 oz and $13.75 minimum for the smallest, lightest box. No one has paid the US Postal Service any federal (tax payer) money since 1982. Dear USPS, You gave China the exports, you gave eBay the profits, and that took water out of the pail at the Postal Service. Ask Congress to put the water back, or stop watering other people's horses. Hunger strikes are what prisoners do when nothing else is possible -- are you on a hunger strike? The eBay flood from China carried to our doors by USPS letter carriers can be roughly estimated as 100 million items a year. a global corporation at work in today's globalized world. Give American Post Office customers the same service. make it available to purchase online. Industrial parts or entire ultrasound scanners, wholesale quantities, fur&leather coats, gold, musical instruments. Complete industrial systems, engine rebuild kits, Fanuc robot parts, gold with gems, instruments, silk rugs, mink, $387,000 free shipping! plastic injection machines, $22,000 flour mill free ship! !, milk pasteurization systems, $13,000 wedding dress from a seller whose positive feedback was built with items under $1, selling under a new name. If you know roughly how many listings there are tonight, how can you tell what got sold? It's a rough estimate, I'll tell you what I did. Bay can choose to criticize what I have done instead of releasing the real numbers. Such an argument would at least be useful as a distraction. ESTIMATING THE PACKAGE STREAM: FROM #LISTED to #SOLD: A few years ago, I stumbled across reports of the largely-unnoticed corporate-government meetings that explained the China explosion on eBay, and all the wind went out of my sails. I knew it would be hard to tell the story, and here it is, taking too much time for both of us. But for me there is no choice. I can't go on maintaining this postage page if I don't do this. It would be like accepting what's going on and pretending the new rates are fine adjustments needed to tweak the system and everything is OK. Even if we can't change anything, let's all be smarter about what's going on so at least we'll make them tell us more creative lies. Total annual sales of Chinese sellers is the total number of packets coming out of China in a package stream which the US Postal Service must deliver. Knowing turns enables us to go from total inventory data (number of listings for all Chinese sellers), which eBay searches can be coaxed to reveal, to total annual sales data, which eBay does not reveal. Most of these items which the USPS must deliver for eBay and China use the ePacket service which eBay created, and get fully-featured, first class service levels which eBay persuaded the Chinese to accept and America to offer, in negotiations that eBay led. To offer the Chinese these services, eBay persuaded the USPS to revamp their logistics information technology which tracks surface shipments and individual airline flights, and to revamp the information technology that tracks individual parcels after ship or plane landing in the USA. At the time, American were denied these services. Can we live with the four-times inventory turns factor until eBay gives us their data? Does it extend across other pricei-of-goods categories? I think so. As in a real market place, a few exceptional sellers capture more volume, with inventory (listing) turns of over 12x, not four. eBay is a protected community, not a free market, and uniform listings offer little variation in marketing or customer contact. How do star Chinese sellers do it? A twelve-turn super seller has secured success on the supply channel side, not on eBay's distribution channel. The seller has locked in supplies of popular items that get 900x repeat sales. These repeat-sale items -- for any seller -- are mostly in fashion, decor trivia, some tech items; and they are mostly under three dollars each -- almost no item is over $10. So this number-of-turns issue -- even more items enter the mail stream than I estimate -- disappears at higher prices. Unlike a real market, the bottom end is a sheltered, virtual un-reality. There are no staff salaries or building rents to pay, no creative destruction to drive a languishing seller bankrupt. So there are numerous sellers who turn little inventory and have a poor fit with a linear trend at sales 4x inventory. But these slow sellers do not invalidate our rough guide because they do not generate many listings. They may have anomalously low turn rates, but these are on small inventories -- a few stragglers past their time of fashion. So, we do not see thousands of items that will not sell, and our count of how many million Chinese items flood the United States Postal Service is not distorted. What is this corporation getting from our national postal system? Ebay should kindly release the data they withhold on the flood of uncompensated mail volume for which they collect seller's fees but the United States does not collect adequate postage. 1. For 1.7 million items costing a dollar or less, 85 to 90% are sold with postage included. The Chinese seller of a 99¢ item can not have paid more than 99¢ for postage. The Chinese seller paid only pennies for postage. The postage paid by these Chinese sellers to cross the Pacific is arguably less than any American must pay just to enter his own postal system with a letter or postcard. 2. The USPS annually carries over 11 million eBay items from China that cost less, postage included, than regular American Post Office customers would have to pay for postage alone, if they could make their item look like a 4 oz "flat" or envelope. Not one of these 11 million items can generate as much compensation to our postal system as Americans pay to post similar items in the opposite direction. 3. The USPS annually carries over 20 million eBay items (11 million plus 9 more) from China that cost less, postage included, than regular American Post Office customers would have to pay for postage alone, to send the smallest possible box (8 oz) to China. 4. The size of eBay's China flood washing over the United States Postal Service (USPS) annually is about 100 million pieces, mostly hauled by letter carriers to your home. Americans are told they must prevent the USPS from failing to cover costs and going into the red. Therefore, Americans must pay $5.10 (if it is under 4oz and flat) or must pay $13.75 (under 8 oz and a box) to send items to China. Yet China sends 11 million items whose total cost, typically with postage included, is less than the $5.10 threshold, and 9 million more under the $13.75 threshold. Therefore, the Chinese are not paying what Americans are told is necessary to keep their postal system solvent and indeed to keep the system in existence at all -- to prevent breaking it up and privatizing it, as discussed above in The Drive for Privatization . Dear Board of Governors, dear USPS anti-fraud Inspector General's Office: Prove me wrong on what China reimburses the US Postal Service for this 100 million item mail stream. If you can't, then tell me why we have to subsidize them. If you can't, then stop criticizing the national postal service as too stupid to be profitable, because you yourselves have set it up to lose money. Give American retail customers the same online access to parcel post shipments ("Retail Ground") as corporate/commercial customers. Paying online for shipping labels for 1st Class Small Parcels and for parcel post ("Retail Ground") service must start now -- turn it on. Ebay customers can pay for Parcel Post ("Retail Ground") shipping labels on line, and ship a box, but non-corporate Americans cannot. We need the convenience; you need the money. P.S. Don't pay a corporation to run the service, let eBay and Pitney-Bowes keep their own page for their own customers, and sell your own stuff on your own Website. Internet e-commerce is driving shipping volumes up as fast as Internet messaging is driving first class mail volumes down. Anyone who argues against hitching the USPS wagon to the rising revenues of this secular trend is an assassin even if you'll never see the dagger go in. Turn on ePacket service for Americans. If it's good enough for eBay, it's good enough for the rest of us. Make the ePacket service which eBay created in its 3-way negotiations with ChinaPost and the USPS available to individual US Postal Retail Service customers. eBay gave ePacket service to individual, retail, Chinese eBay sellers. Now give ePacket service to individual American citizens. You have a "Commercial Outbound ePacket Service". Turn in on for Retail USPS Customers. In negotiations concluded in April 2010, Ebay created the ePacket service that opened the floodgates (June 2011) to most of the approximately 100 million parcels from China on which eBay earns a portion of its $8.5 billion annual income. Individual Chinese sellers use this service. The USPS today also has reciprocal ePacket services outbound to over two dozen countries. What's good for one is good for all -- they buy from their post office, we want to buy from ours. Turn on outbound ePacket service for on-line American individuals. Publish the settlement fees that the US Postal System collects for delivering ePacket traffic with full first-class service: scanning, tracking, delivery confirmation, computer-based logistics monitoring of the shipping channels, guaranteed service levels, door-to-door delivery. Never put in the network, database and information technology systems needed to track the data and get the settlement fees? Fix it. In the century of globalization, in a wealthy country that buys a lot overseas, the US Postal Service is going to deliver a rising volume of package traffic ordered by their own wealthy citizens, but dropped into the mail and paid for far away. When did you last upgrade your automated computer and network systems for tracking these items. eBay alone is 100 million items/year, did you catch them? What are you paid for serving foreign governments? Show me the money. I don't care what overseas countries do with what we ship to them, that's their budget. You criticize our postal system's lack of money, tell me what they pay us. The Post Office and many government Departments have been assigned (1978, 1988) quasi-independent "Offices of the Inspector General" (OIGs), who, it was hoped, will eternally catch fraud in suppliers to those Departments and sometimes in the Departments themselves. Any such hope in OIGs may be misguided. "In the 2014 audit mentioned above, the OIG found the FY 2012 cost of a typical domestic First-Class, single-piece package was $1.10 higher than the rate China Post was paying." Numbers in that report do not agree with figures and eBay search results presented here. For that report, government officials in the Inspector General's Office ordered a few test items. I tallied every listing from China in May 2016. ChinaPost is eBay's carrier, the one they negotiated with. But that $1.10 giveaway was renegotiated and everything is fine now, the OIG (Office of the Inspector General [for the USPS]) report says. Correct me if I'm wrong, but traffic is 100 million items and the Inspector General says $1.10 was lost on each one. And everything is fine now, don't ask more questions? $5 gets you ten that political pressure suppressed the full report of what was happening in FY2012. Look at the timing. The ChinaPost negotiations we never heard about concluded in June 2010, the information technology upgrades to integrate China with our postal system were complete by April, 2011 and eBay's ePacket system went live then. So FY2012 was the first check on how the system was doing. Someone in the Inspector General's office saw new losses appearing at a dollar per item, and that was the last we heard about it. And as for the corporation that catalyzed it all? Dear eBay: you are an $8.5 billion/year company based on a website that costs only $1.5B to run, leaving about seven billion dollars a year in earnings. You choose to give yourself back about half of those seven billion dollars as salary. Fine, enjoy it. What does eBay pay in taxes compared to those seven billion dollars? As just noted, you take half of it home for yourself, 3.5 billion dollars. At what level have you decided to support the country that gave birth to the on-line auction, indeed to the Internet? Civic society -- namely, our communities and our relations with one another -- can get lost when profit is the only goal. The country -- the welfare of the United States of America, its role in the world, its greatness as a nation, whether others see us as friend or foe -- this is not what counts when profit comes first. In the end, we lose greatness itself when we become preoccupied with profit alone. All of us can count on a future in which the US Postal Service delivers junk mail at reduced rates for corporate clients right up until the day the system vanishes forever. On that day there will be less competition for the corporations that killed it, paid for the funeral in advance, and always wanted the business. Live with it, get with the program. The failure of post offices everywhere is the free market at work. So just accept it. And when the banks failed?